The boneless arm steak, also referred to as the boneless Swiss steak, is a piece of meat marbled with fat that comes from the shoulder of a cow. Cooking a tough piece of meat such as a boneless arm steak can be a challenge. This is because the texture can often times turn out dry or leathery. 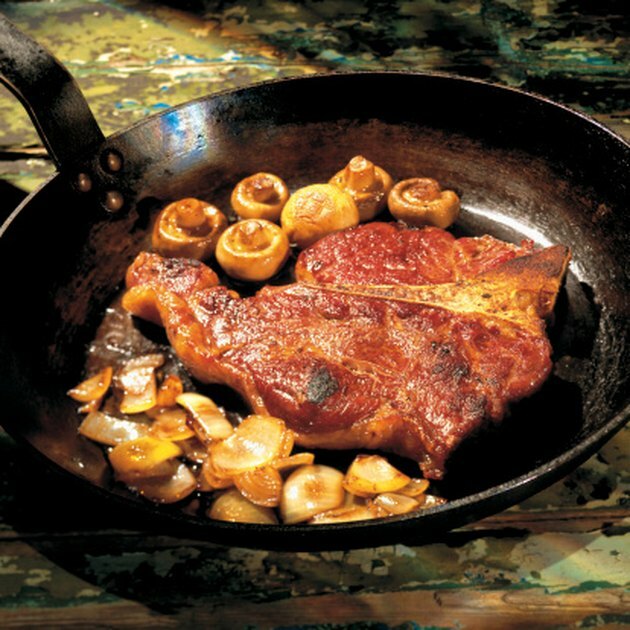 However, the proper cooking techniques and temperature can turn a tough steak into a juicy and flavorful one. Marinate your steak for up to 24 hours in the refrigerator before cooking. Do this by adding your steak to a bowl or baggie full of aromatics such as salt water and fresh herbs like sage or thyme to help tenderize a tough cut of arm steak. Pat the steak dry with paper towel when done marinating and allow it to come to room temperature. Sprinkle both sides of your steak with seasonings such as herbs like thyme and rosemary, salt and pepper. Coat a large, heavy skillet with olive oil or a non-stick cooking spray. Preheat your pan over medium-high heat for about ten minutes or until it is extremely hot, but not smoking. Position your arm steak in the pan after it is very hot. If cooking more than one steak, do not allow any meat to touch. Cook for about three minutes on each side and then reduce the heat to medium and cook for another three minutes on each side. Press the steak with your fingertip to test for doneness. A rare steak will feel soft, a well-done steak will feel firm and a medium steak should feel somewhere in between. Rest your steak on a cutting board for a few minutes to allow the juices to redistribute into the meat and then serve. If desired, cut into kabobs or add to a stew. Better Homes and Gardens discourages adding any liquid to the pan or covering the steak while it cooks. This can cause the meat to brown too quickly, leaving the inside pink and underdone. Be careful not to pierce the steak while you are turning it or removing it from the pan. This will allow the juices to escape. Raw meat such as arm steak can harbor food borne bacteria such as salmonella. The USDA recommends washing your hands with warm, soapy water before and after handling raw meat. Be careful not to cross contaminate -- do not reuse utensils, surfaces or plates that have touched raw meat without washing them thoroughly first.